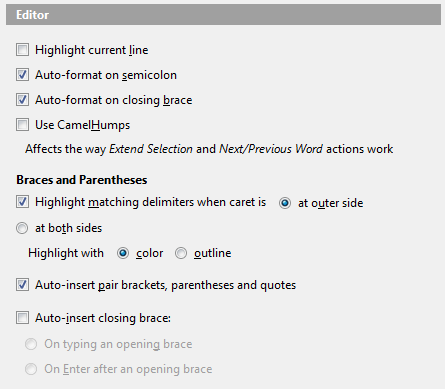 And no further automatic changes occur when the last brace is typed. My R# version is Build 5.1.3000.12 on 2011-01-28T04:05:56, and Visual Studio is at version 10.0.30319.1.
screenshot of ReSharper | Options | Environment | Editor tab? Thank you! Studio is at version 10.0.30319.1. Possibly of relevance - our C# files are generally stored with Unix line-endings, i.e. LF only, not CRLF, although it seems hard to keep them like this - I am frequently warned of mixed line-endings and have to reset the files to LF only. (I think I use Productivity Power Tools' "Fix Mixed Tabs" for that.) It might be that this problem depends on the line-endings of the existing code. I'll need to check. the indentation as soon as one types the second closing brace. Thank you!